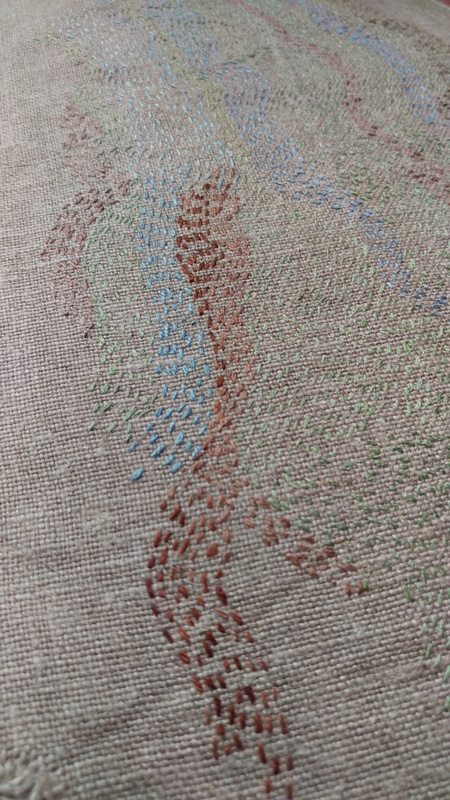 A little while back, I decanted some silk stitching thread that had been steeping in dye for a year or two or three–using India Flint’s Stuff, Steep and Store preservation dyeing method. As so often happens in my case, one project leads to the next. The scraps left from converting unwanted trousers into bags were the biggest scraps sitting on the small scraps pile when I felt the pull to make “beloved tree” banners. I decided that this might be a fun Womadelaide project–there I would be over a long weekend, sitting under beautiful trees listening to music. What could be better? It was going to be way too hot for substantial knitting projects. 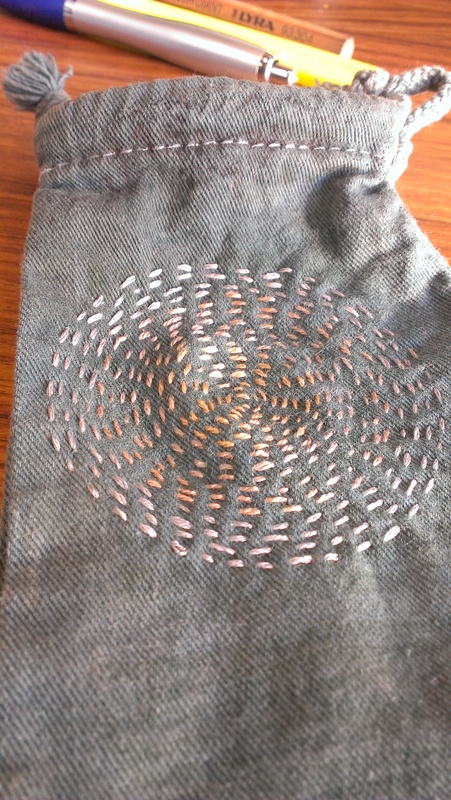 I decided if I took needle, thread and some calico or sheet offcuts–that would be a good start, and that is how I began. Before I went on day 2 I made some “frames”. You can see how this goes. It’s simple but it gives a sense of framing the words that I like. It somehow draws in the idea of that-which-is-framed being important, precious in some way. And there I sat–I have inherited a small embroidery hoop. I usually don’t use one, but it seemed like it might help and it caused several conversations with smaller people interested in the whys and mechanics of things, which were also fun. Afterward, I found more calico/scraps/leftover bits of ancient sheets or tablecloths and stitched them on to create a backing and a neat edge around the frame. There are six in all, some with linen frames. 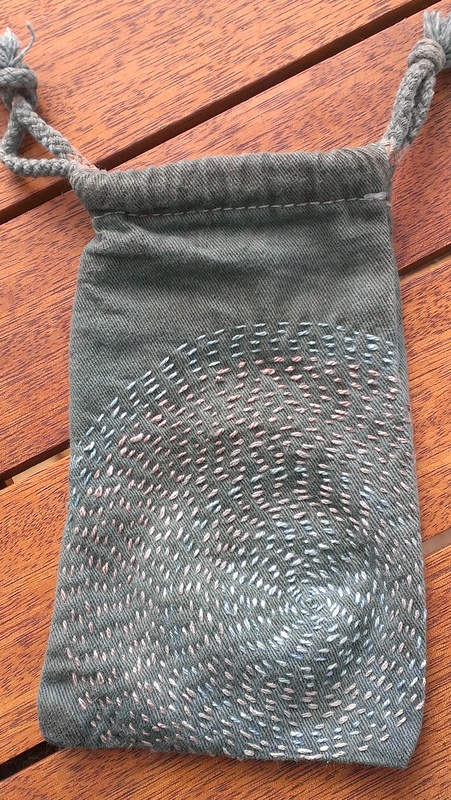 Some framed with offcuts of denim jeans that have passed into new incarnations as bags. And now they are ready to be applied to trees. I do feel as though a tree needs no adornment. However, I feel all too conscious that trees are not universally beloved. After the last big storm in which trees came down on cars and the tram line in our neighbourhood, I put up two earlier banners, and one was removed almost immediately. I don’t know whether it was souvenir-ed or whether it was taken down by someone who didn’t accept the message. But I do know that at such times trees around me face higher degrees of threat, and this is one thing I can do. Maybe this weekend of earth hour is the time for some to go out into the world? 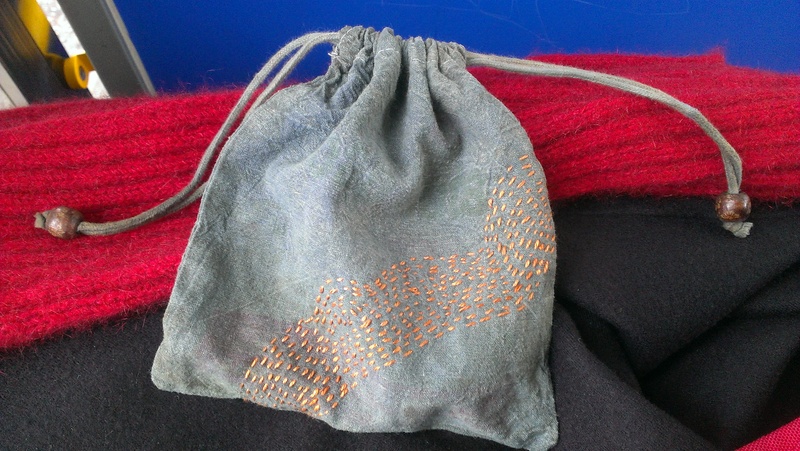 I have been embroidering some small bags. They came with crowd sourced underwear (organic, fair trade) in them, with all the good information about the product printed onto unbleached calico. Seven bags in all! 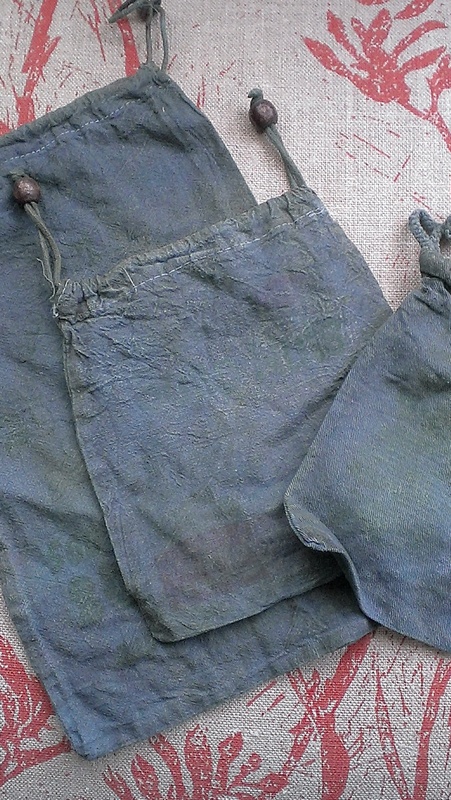 I decided to convert them to loveliness and started with dyeing them in indigo. They are all slightly different shades of blue, some having been dipped more times than others. I am not a sophisticated embroiderer. But I keep being given cast off embroidery thread, so there was no shortage of thread and no shortage of portable canvases for stitching. 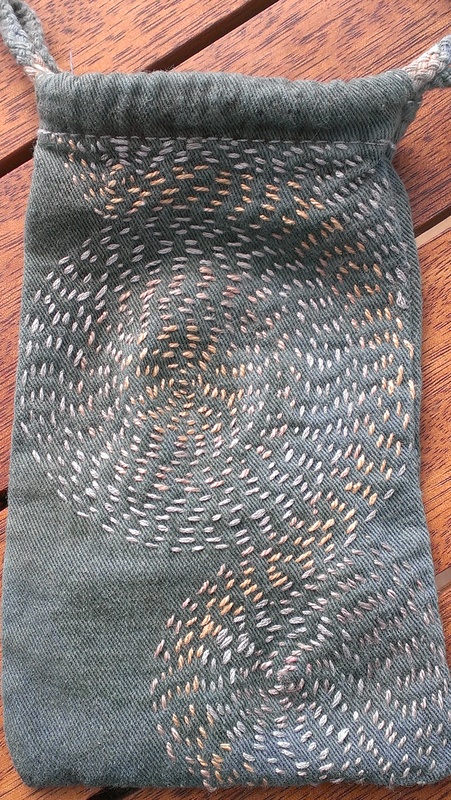 So I tried several patterns and admit I still enjoy the spiral most of all. One of the bags went travelling with my Mum when she was looking for a simple project, so then there were six. And after all these adventures in stitching, there is yet one waiting to be embroidered. I learned some things about how to store embroidery thread from the heritage items that have come to me, some of them in tangles, some in the original skeins, and some wrapped on cardboard shapes that keep the thread neat without taking up a lot of space and using something that comes into the house all the time. Thank you to those women whose hands have held these threads already and whose minds have touched mine however distantly in this way. I have been very much enjoying adding to India Flint’s Wandercards. One of my beloved friends said something about them that made me think she might like a set of her own. Well, they won’t be a set of India’s lovely cards, but nevertheless, a set of plant dyed cards with quotes that might help her to keep her heart full and her courage blazing through tough times. I wish I could make cards as beautiful as those India selected,–beautiful paper with rounded corners and such–but I decided to embrace the imperfection and do what I could. Then there was the question of a suitable bag. I thought I’d make one, but then I realised I already had a perfect bag. Here I am on a train, embroidering on it and listening to an audio book. Audio books and podcasts make public transport so pleasurable! And so, a set of cards and a little bag for them to live in, packaged up and ready to send to their new home! I know my friend will add quotes from her favourite poets and sources of inspiration. I regret to say that this is a report on an exhibition that has since closed. The wonderful (and local-to-me) Isobel McGarry exhibited during winter at Gallery M in Marion. 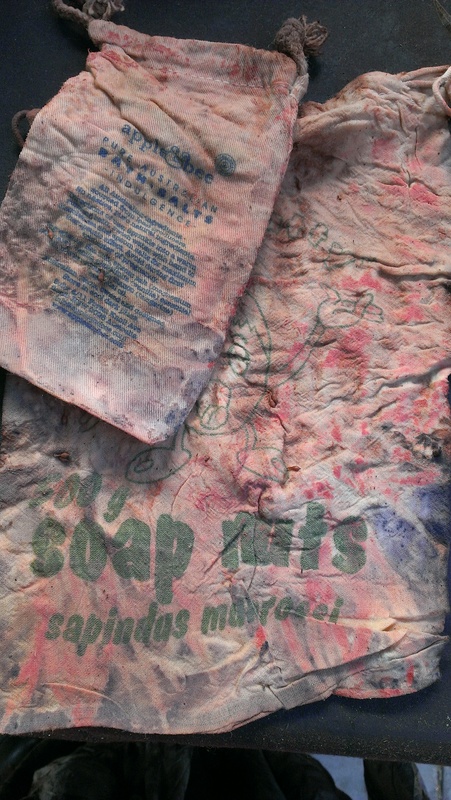 Isobel is a dyer who uses eco-prints in her works. However, the thing that strikes me as really central to her work is her embroidery. She uses an extraordinary number of tiny stitches. She often embroiders on silk, and her work shows a fascination with Japanese textile traditions and culture. I loved the combination of these gorgeous works with Japanese poetry. As always in these techniques, the splendour of lovely details is part of the pleasure. Every little detail has been attended to and embellished. Isobel’s longing for peace seems to me to be accompanied by meditations on all that war has caused us to lose… and so the themes of fallen leaves and of the crucifix evident in so many cemeteries in this part of the world are persistent. A small posse of us who are admirers of Isobel’s work were privileged to go and admire the exhibit together one winter’s weekend, and it was good to spend time appreciating all that detail. I still have some upholstery fabric left from having some chairs re-covered. It is natural linen, a lovely fabric. I have been wondering what to do with it. One day I went to an exhibition of Papunya artists in the City Gallery of Flinders University (on the ground floor of the State Library) and I came home longing to embroider. I can’t exactly say why. Perhaps it is partly that some of these glorious paintings are such clear manifestations of the principle that many tiny marks can make a whole that is sheer wonder. I marvelled at the capacity of these artists to hold entire desert landscapes and the stories of these places in their minds, and from these to create spectacular images which somehow communicate the story and the place. Even if I cannot begin to grasp all that they might have in mind in creating these works, I can still stand in awe. I don’t need to be able to create wonder. I don’t expect to, and I don’t mind. But stitches are tiny. Perhaps the immediate thing was simply the invitation to begin. 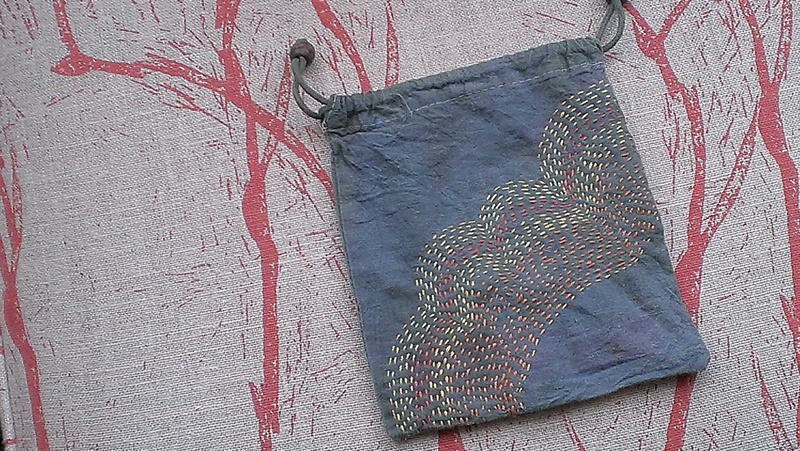 These threads have been dyed with indigo, pansy, hibiscus and eucalyptus. 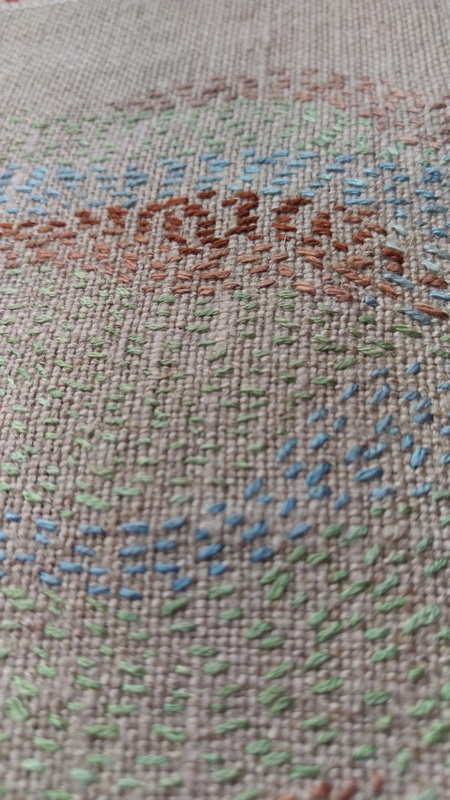 I love their subtlety and the slight sheen of the silk thread against the matte texture of the linen. I love the effects of uneven dyeing, as it turns out. Even dyeing is overrated! Once I had decided I was done (which is a com0plicated thing in itself, I find), I settled on yet another bag. 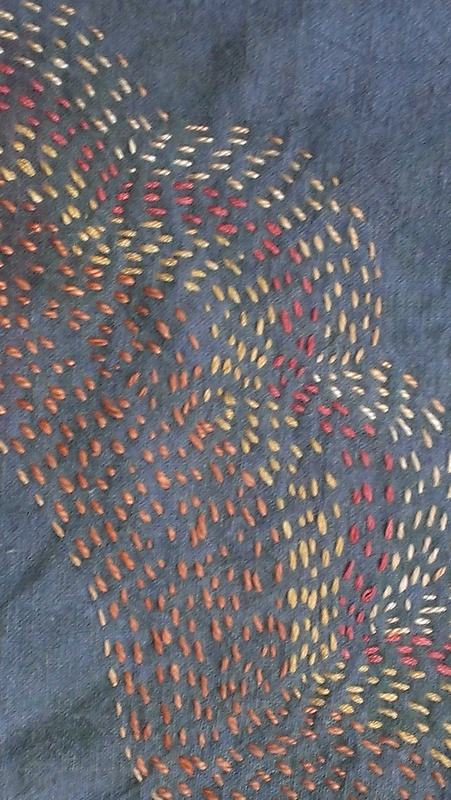 The lining is made of patchworked silk scraps dyed with all kinds of plants. And then, just because I can never make just one… I made another with a different piece of upholstery fabric and some scraps of recycled fabric of different weights. While we were travelling on holiday, I was really surprised to find that I regretted leaving my stitching kit at home. In the end, I rootled through an op shop on the Mornington Peninsula (Victoria), and then another in Melbourne, and managed to lay in a few needles, some ancient cocktail napkins, and some leftover thread. And even a perfect little box. I had been doing inspiring reading for the year of activism ahead, and had some ideas for embroidery which I began to put into stitches. First, pencilled on. Some time later, I ended up with this, embellished with some small findings from the beach. These may make it deeply impractical, but I figure the worst case is that I cut them off again. It’s scruffy, like all my embroidery. But, I like it. I find it a constant struggle to think about the deeply painful challenges that face each of us, and the planet and all who live upon her (human and otherwise). I notice that for many people, facing the trouble we are in is so painful that they would rather look away or that they simply can’t find hope. I keep trying to make another decision: to face the trouble we are in, and to stay hopeful and active. Which is not the same as living without contradictions or mistakes, of which I feel sure, there will be plenty more! 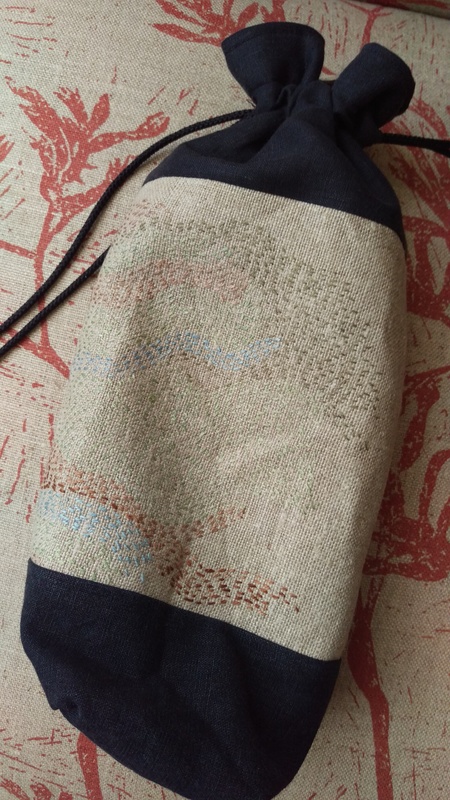 My needle and I moved on to another little indigo dyed bag that arrived at our house as a printed calico bag full of bath salts. Here it is on a table in a coffee shop, in progress. 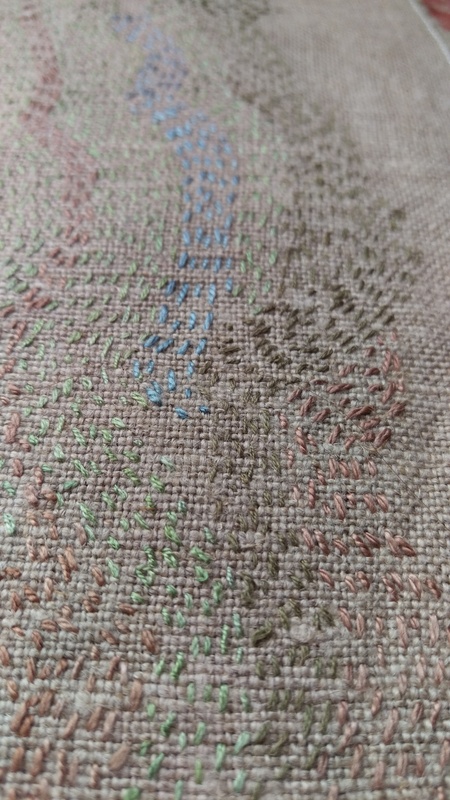 I love the way the silk thread has a little sheen over the matte background of the calico. 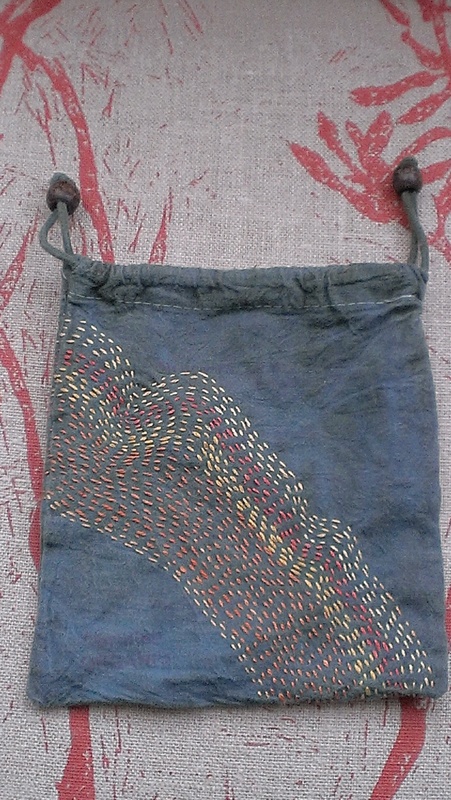 This one is stitched with silk thread dyed with cold processed austral indigo (silvery grey), indigo, eucalyptus cinerea exhaust and plum pine. 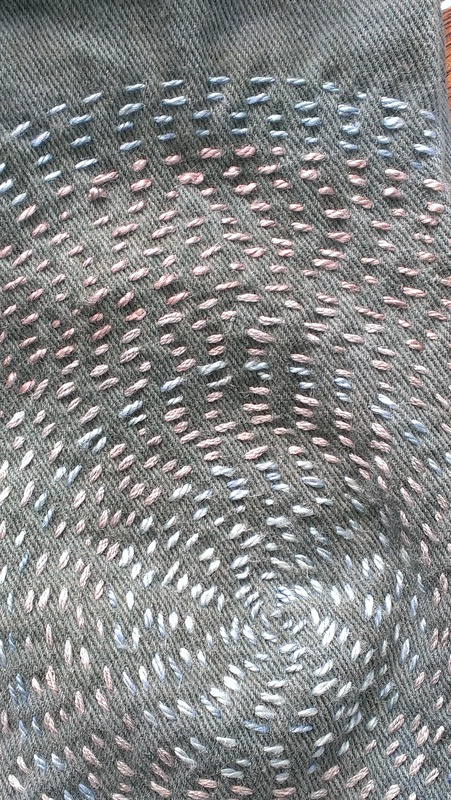 I like these subtle colours, even though some of them felt really disappointing when first they emerged from the dye. They work beautifully in this context, I think. Another lesson in life from the dye pot! Somehow I have fallen down another rabbit hole… I seem to be stitching. A lot. Still with the project of making what is merely functional, more beautiful. 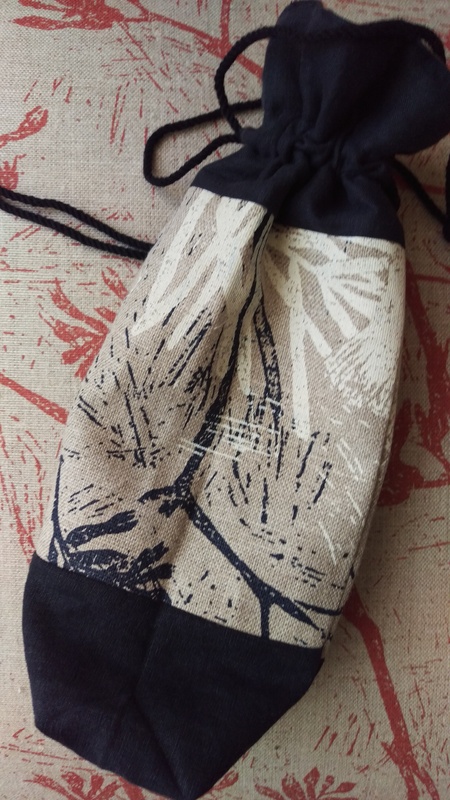 I started out with three calico drawstring bags that had held bath salts and soap nuts. 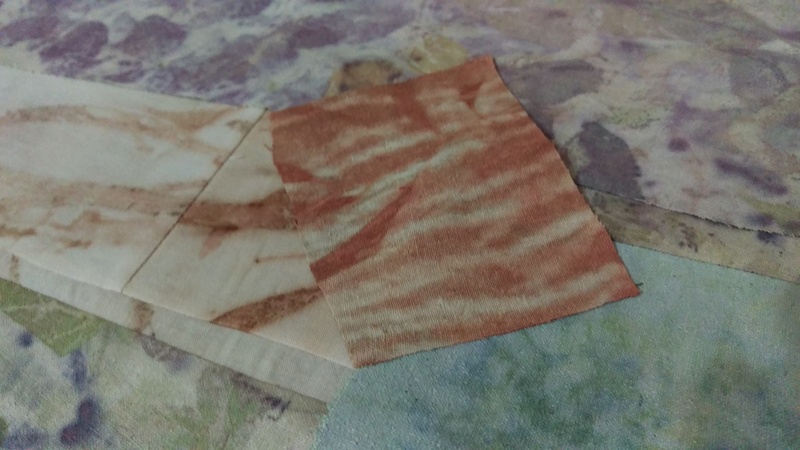 I had a spectacular dyeing fail using eucalyptus. Go figure. Certainly not an improvement! I dipped them in the indigo vat a few times, a while back. Better. Then one day I suddenly saw what to do. I started and then kept going. Here I am with it in progress on my lap on the bus to work. Threads dyed with madder, grevillea robusta, and eucalyptus.